Good Asian food is such a mood enhancer. It always feels like sunshine to me, although it is of course not true. It can be cold in Asia as well. But on this particular cold evening in Vienna a dinner at Han am Stadtpark worked like a charm. 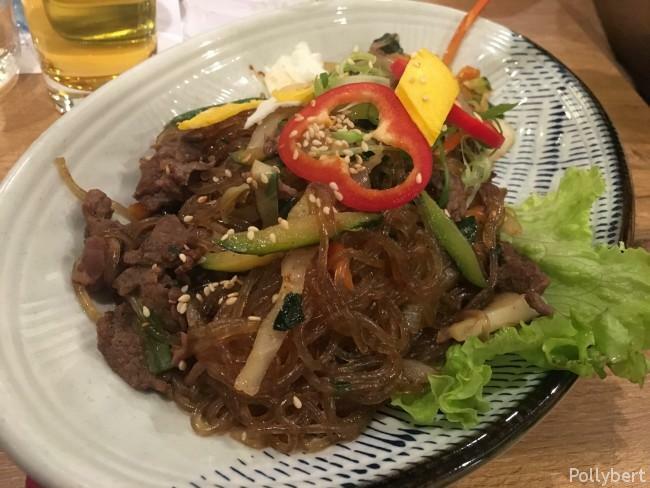 Korean food is still a rare find in Vienna. 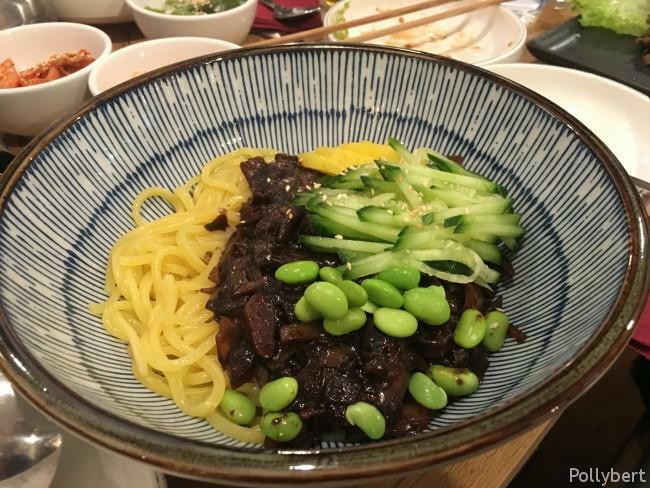 It has only recently increased in popularity (read here about my visit to BiBim restaurant). The majority of Asian restaurants in Vienna is still Sushi, Thai, and Vietnamese places. Or the convenient all-in-one Asian restaurant. 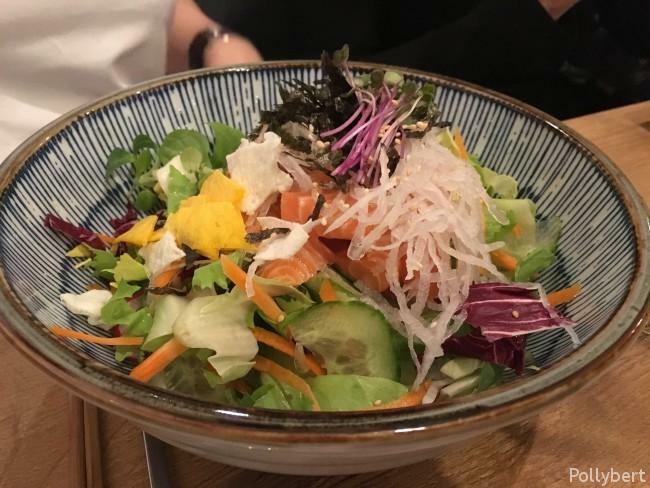 Han am Stadtpark not only serves Korean food but also specialises in the art of food which it shows with its soups. Before we got to the soups though we started with Banchan (starters). 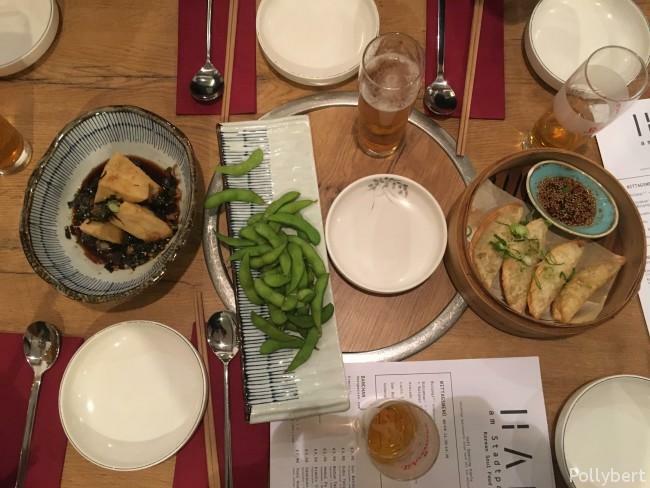 We took the Banchan Set, a mix of kimchi, pickled radish and pickled peppers, as well as fried tofu with bonito flakes (Dubu Twigim), edamame, and fried vegetarian pastry (Gun Mandu). The edamame were the only thing not so great. They appeared too long cooked and overall boring. The kimchi, the tofu and the pastry were so good that we ordered a second helping for the table. 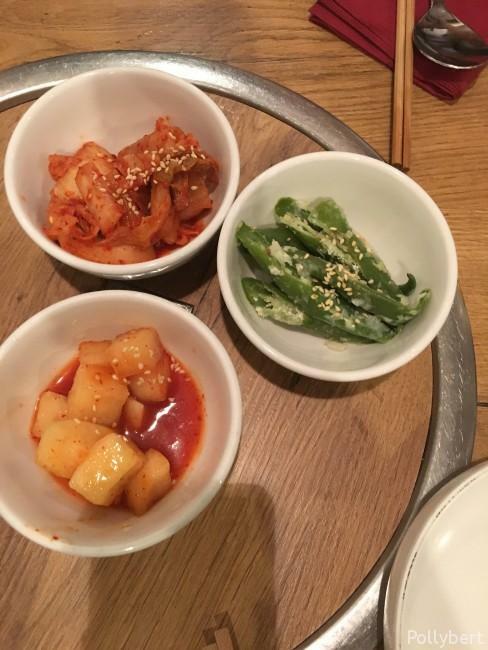 The picture of the Banchan set is not identical with what we got. This set here was served with the later ordered Chongol soup pot. The peppers here were fried and the little white squares I couldn’t identify. 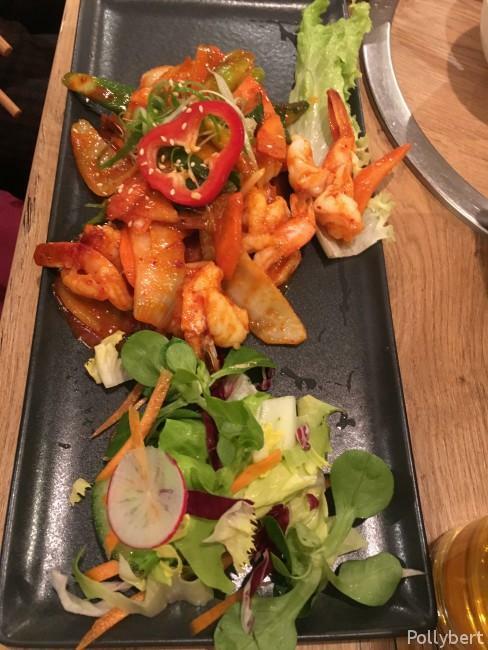 The main dishes looked all amazing. I had found a willing person to share a Kimchi Chongol pot (only for two persons or more). Since it’s one of the restaurant’s specialties, I had to try it. Unfortunately for us the cooker in the table was at our table out-of-order. So we got a mobile cooker and check out this soup pot. Doesn’t it look delicious? Because this is exactly how it tasted. 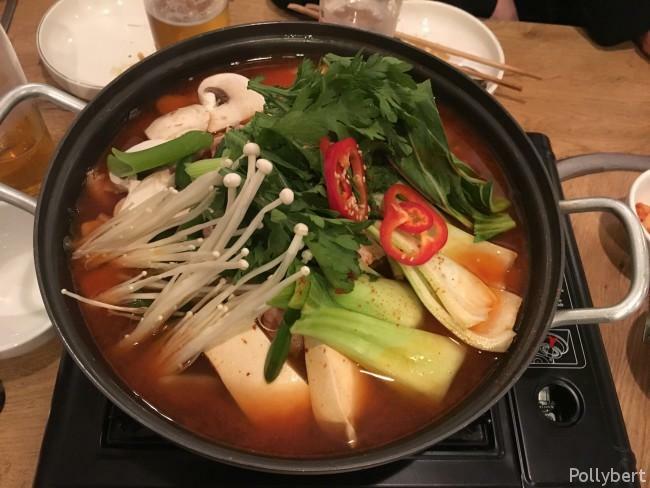 The mix of kimchi, tofu, pork belly (sliced super thin), and vegetables all in a broth with a gentle heat was perfect for a cold evening. and a Bulgogi, which is beef with vegetables. All main dishes were served with rice. Interestingly enough I have another dish which doesn’t correspond with anything on the online menu. I was allowed to taste it though. The noodles with the mashed beans and beef sauce were amazing. So although I can’t tell you what it was, I want to share it with you. 3. 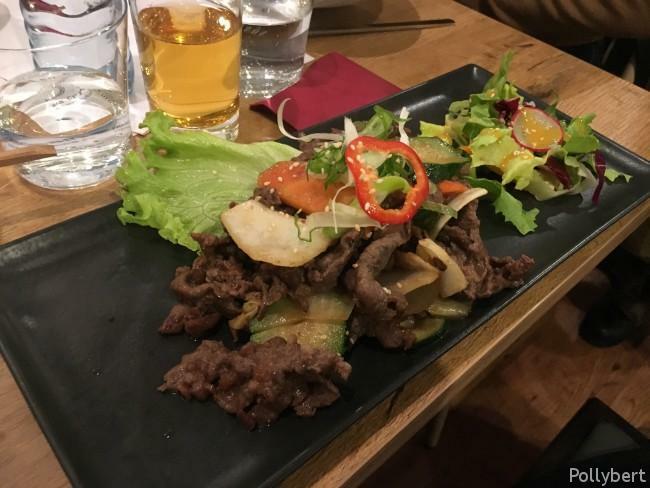 Bezirk, Asian food, Austria, authentic, Korean food, restaurant review, Vienna, Wien. Bookmark.